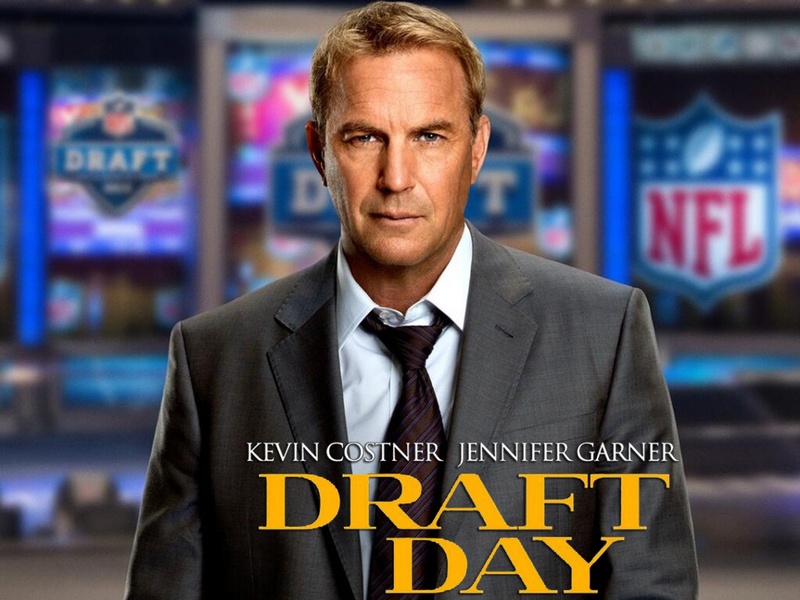 Quickfire Review: Draft Day (2014) How Now Brown Costner – Hooray For Movies!! Synopsis: At the NFL Draft, general manager Sonny Weaver has the opportunity to rebuild his team when he trades for the number one pick. He must decide what he’s willing to sacrifice on a life-changing day for a few hundred young men with NFL dreams. Sports movies, like video game adaptations, can be a very hit or miss affair. When they’re great they’re Any Given Sunday. When they’re bad they’re Leatherheads. Kevin Costner has an unusually solid history with sports movies, having scored big in the 90’s with Field of Dreams and Tin Cup. So in teaming up with Jason Reitman, a director with a track record of delivering emotionally driven, but never sentimental, comedies, Draft Day was always likely to stand a better chance than without those two involved, although not enough to make it any more than forgettable family. Set on the day of the 2014 NFL draft, albeit it with fictionalised college players and NFL team staff making up the cast, the focus is on Cleveland Browns GM Sonny Weaver, as he tries to save his job by wheeling and dealing around the board. When he makes a franchise defining trade with the Seattle Seahawks seemingly in order to secure the pick for top rated Quarterback Bo Callahan. Over the next day Weaver faces battles with his staff, coaches, headed up by Dennis Leary in full Leary mode, team owner Anthony Molina (Frank Langella), his girlfriend (Jennifer Garner), who also happens to be a team Executive and secondarily also happens to be pregnant, his mother (Ellyn Burstyn), ex-wife and the legacy of his dead father. Oh and the fans. Oh and the media. Anyone else? And therein lies the fundemental problem with Draft Day. It can be forgiven for being the sports movie equivalent of a Starbucks sandwich; nice packaging and all the right ingredients but without the flavour to justify the price. The comparisons to Moneyball are inevitable but this lacks both Brad Pitt’s charisma and Aaron Sorkin’s words. No, the main problem is that Reitman and his writing team of Scott Rothman and Rajiv Joseph try and cram far too many unnecessary subplots into a film that doesn’t require them, only serving to distract from the main drama rather than enhance it. It is enough that Weaver is dating another member of the organisation, why does she also have to be pregnant? Unlike Moneyball which is an enjoyable movie despite the baseball, Draft Day is really only for NFL fans who will get a kick from the various cameos and an insight into the workings of a teams war room during the most hectic day of the NFL calendar. Draft Day. Conclusion: Fun for football fans, and an easy watch, but there are too many competing sub plots to make it particularly interesting for anyone else. A rare blip for Reitman. When it was paying attention to the actual draft itself, it works. But everything else is just unneeded filler. Good review.